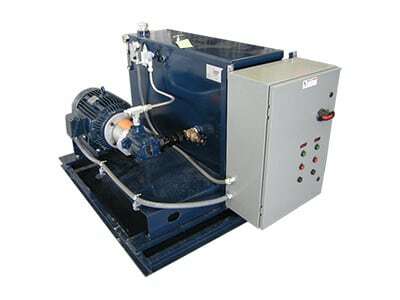 Pump skids are versatile, air driven pressure generating systems that can be provided in pressures from 100 psi, up to 150,000 psi as well as a number of different arrangements to best suit your application. All of the components are mounted and plumbed in an open frame stainless steel rack with a sloped front control panel containing the valves and gauges for easy use. Casters can be added if portability is required. Single or Multiple pump designs are available such as a typical high/low system for fast fill and pressurization. 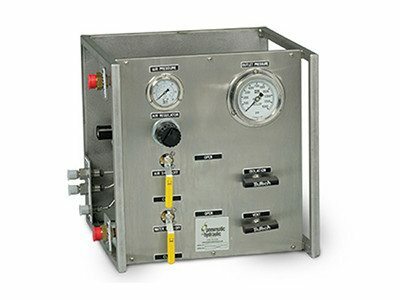 They include all air controls, an outlet pressure gauge and outlet pressure isolation and vent valves. They can be used with city water or other approved liquids. For more information, or to order a customized pump skid, call us at 877-836-1999.